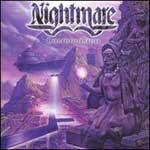 French power metal band Nightmare was founded in 1979. Sometimes when thinking about what I want to say about a CD, all I really want to say is "I like it" and leave it at that. This was one of those CDs that I really just liked alot but wasn't sure how to put it into words. In simple terms, Nightmare are good, old-fashioned, heavy metal. There are a few modern touches, mostly in the production, but overall this is music that will please the fan of old school galloping heavy metal. One of the unique things about Nightmare is their killer melodies and those big, fat choruses. It's almost hard to explain, but many of the choruses consist of those big, echoey, vocals that sound like they were recorded by a bunch of monks in a big empty church building. The guitars are heavy, the solos shred, the drums are pounding, the songs are memorable and catchy, and the vocals are enjoyable. What more needs to be said? I like it! Having already been familiar with the band's stellar release, "Cosmovision", I thought I pretty much knew what to expect. That album hit me hard up front and I really enjoyed it for a while. After a while, however, I didn't revisit the album much. 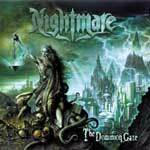 "The Dominion Gate" in much the same way is an outstanding power metal CD right up front. Time will tell if it holds up, but within a month of owning the CD, I have given it several spins. To be quite honest, I find that a lot of the power metal bands out are bland and generic, so much so that I have almost grown tired of the movement. However, I find this release to be a diamond in the rough of an otherwise crowded market of European power metal bands. The guitars are heavy and powerful, with excellent guitar solos in each and every song. The use of some keyboards, symphonic elements, choirs, and female vocals place these guys in that same melodic power metal category as Symphony X and Rhapsody. However, they also incorporate a lot of 'old school' heavy metal attitude and a touch of thrash. There is plenty of fast guitar picking and double bass. What really makes this band stand above the pack is lead vocals of Jo Amore. This man can sing. He has a slightly rough-edged, deep and solid voice that reminds me a bit of Ronnie James Dio at times, although more in tone than in style. It's really hard to point out any real standout cuts, because I found the entire CD a solid listen, including the ballad "Haunting Memories". However, one song that did stand out was "Heretic", which is one of the albums heavier tracks. Lyrics are a bit typical of the genre, singing the praises of dungeons and warriors, but I don't mind this much. A couple of guest appearances from After Forever's Floor Jansen and Sander Gommans and Ricky Marx (ex-Pretty Maids), lead guitar on the title track, deserves mentioning as well.